MYhpi is a great way to get ALL the information you need for your HPI car or truck. From the basics like instruction manuals and spare parts information, to kit updates and option parts. 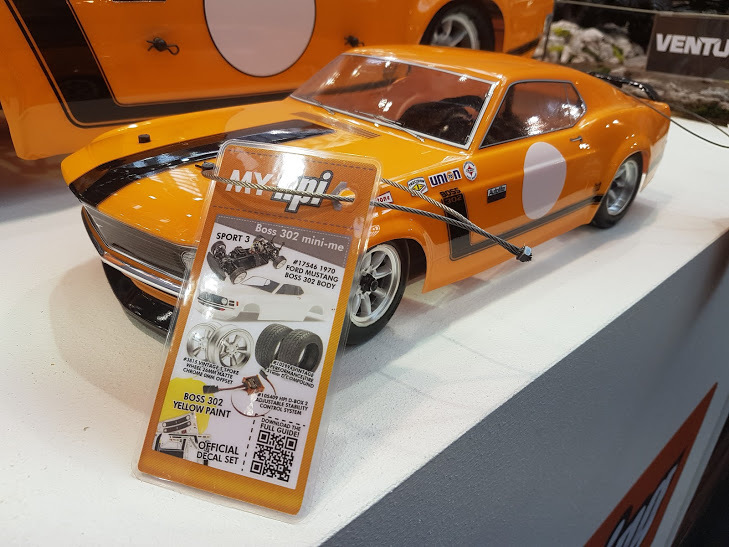 Customizing your vehicle is just as important for RC car owners as it is for full-size car fans, and MYhpi is a great way to see what's available for your HPI vehicle! Check out the video above for some excellent ideas or see the cars and trucks up close here, complete with the parts used to make them one-of-a-kind! Who wouldn't want a "mini-me" version of their RC car - when their bigger RC car is the Baja 5R (which is coming soon!)? This Ford Mustang Boss 302 pairing is really set off by the smaller version, which is on the 1/10th scale RS4 Sport 3 chassis fitted with loads of option parts. Starting with the #11850 4000KV brushless motor and #12851 3S-capable speed controller, the steering was beefed up with the #110650 high-power servo. Then, the shock towers were upgraded to woven graphite versions (#114433 and #114434), and the chassis was stiffened up with the #114432 center drive shaft cover. The drivetrain was strengthened with the #114436 spool, a pair of #114437 universal driveshaft sets and #109926 heavy-duty diff shafts front and rear. These all add up to a super-fast, extra-powerful and extra-tough Sport 3! To make the car match awesome shape and style of the Baja 5R, the #17546 body was used and painted in a matching color, then #102993 and #102994 vintage performance tires were fitted to #3808 and #3803 8-spoke vintage wheels in matte chrome. To help control all the power of the HPI Flux brushless motor, the #105409 D-Box 2 was found to be the perfect choice! This Crawler King has been fitted with a #7186 van body which has been painted a nice blue color, then some of the body panels have been sticker-bombed with a variety of logos and decals from a range of HPI bodies and kits. Sticker bombing is a great way to get a quick custom look, because of the random arrangement of stickers and logos! The body was then fitted with scale windshield wipers and door mirrors from the #85529 and #85613 accessory sets, then #4894 Mud Thrasher tires from the Wheely King were fitted to black #3061 Classic King wheels for a cool look that focuses the eye on the bright stickers on the body. The Sprint 2 is a great car to customize, just because there are so many different bodies and wheels you can fit to it. This one features the #17209 Toyota Trueno AE86 body in 190mm width, fitted with the #7129 Stage-D Run Free Body Kit! It adds extra width and style to the hachi-roku for a super-cool look. It was then custom painted and stickered up in drift style graphics. Everyone loves the classic metallic blue on Subaru cars - especially when it's a McRae replica #7312 1998 Impreza WRX! This body is finished with just the stickers that come with the body set, so as you can it's super-easy to make your own Colin McRae tribute car. Of course, gold wheels are required to finish the official Subaru World Rally Team look, and our #3711 or #3716 26mm mesh wheels in black make a great base, just spray paint them gold (available from most DIY stores) and wrap them with our #4467 replica Pirelli T Rally tires for instant rally action! If you don't know who "Tommi" is, that's Mr. Tommi Makinen, Finnish rally star and legend of the gravel time attack! This RS4 Sport 3 is fitted with teh #7448 Mitsubishi Evo VI body and painted in the official colors of the Ralli Art team - the simple red and white scheme is all you need for rally style points - and the masking for the white parts of the body comes with the body set! Finish (!) the car with white #3303 wheels and #4467 Pirelli T Rally gravel tires and you're off! This custom-painted #106562 Ford Raptor truck body sits on a standard Crawler King chassis and is an example of an easy design anyone can paint with spray cans or airbrush. Using masking tape or liquid masking material, just cut jagged shapes and spray the black first, then the silver and then the orange and you have a striking yet simple design that looks great on any type of car or truck body! The body was finished with accessory sets #85529 and #85613 for extra detail, then the truck was fitted with #113337 wheels and #67772 tires. As you can see, customizing your HPI car or truck is great fun and you can get wonderful results! And when you use MYhpi to help you choose the parts for your ride, it's easy, too!